Today, the Constitution Commemorative Gold Five-Dollar Coin remembers when Vermont became the 14th “state” to ratify the new federal constitution, though it would be March before they became a state in the new Union. Act and Resolutions of the Convention, transmitted to the General Assembly of Vermont, and the President of the United States. State of Vermont— In Convention of the Delegates of the People of the State of Vermont. And declare that, immediately from, and after, this State shall be admitted by the Congress into the Union, and to a full participation of the benefits of the government now enjoyed by the States in the Union, the same shall be binding on us and the people of the State of Vermont forever. Done at Bennington, in the County of Bennington, the tenth day of January, in the 15th year of the Independence of the United States of America, one thousand seven hundred and ninety one. State of Vermont ss Bennington January 10, 1791. The foregoing ratification was agreed to, and signed by one hundred and five, and dissented to, by four; which is a majority of one hundred and one. Attest, Roswell Hopkins, Secretary of Convention. Resolved (the Governor of this State being President) that the Vice President be and hereby is directed to transmit to his Excellency the Governor Duplicates of the act of this Convention ratifying the Constitution of the United States of America to be by him transmitted to the President of the United States and the Legislature of this State. State of Vermont. In Convention Bennington, January 10th 1791. Resolved that the following recommendations be signed by the Vice President and Countersigned by the Secretary of this Convention and be by the Vice President transmitted to the Governor of this State to be by him communicated to the Legislature, viz. Resolved that it be recommended by this Convention to the Legislature at their adjourned session in January instant to take effectual measures in the proposed negotiation with the Congress of the United States of America for the admission of this State into the Confederated government that the act of the Commissioners of the State of New York for removing obstacles &c. done at New York on the 7th day of October- in the 15th- year of the Independence of the United States of America A. D. 1790— and the act of this State in consequence thereof— also an act of this State entitled an act for quieting [settling] disputes concerning landed property be in no wise impeached but that the same be and remain in full force to all intents & purposes for which they were enacted & made. Be it further recommended that the legislature so modify the several laws commonly called tender acts as shall be least obnoxious to the constitution of the United States & least prejudicial to the citizens of this & the United States, where contracts are subject to the operation of these Laws. Be it further recommended that as soon as this State shall be received into the Union the Legislature do take the most effectual measures to procure an equitable adjustment of the expenditures of this State during the late War between Great Britain & the United States. By order of Convention, Moses Robinson, Vice President. The adoption of the constitution of the United States by Vermont was an occasion of joy in the nation, and specially in New York and Vermont, the States which had been so long contending. ALBANY, [N. Y.,] January 13. XIVth Pillar of Our Free and Happy Federal Government. Yesterday morning, the pleasing intelligence of our sister state, Vermont, having adopted the American constitution, by a state convention, was received by a gentleman of character from that quarter — and at one o’clock, the independent company of artillery paraded, in uniform, and fired a federal salute of 14 guns from Forthill, which was followed by three cheerful huzzas, from a number of our most respectable citizens. This agreeable event, which closes the circle of our federal union, cannot fail of being received with the utmost satisfaction by all Americans, of every description, who are friends to order, unanimity, and good government, and to the true welfare of our happy country. 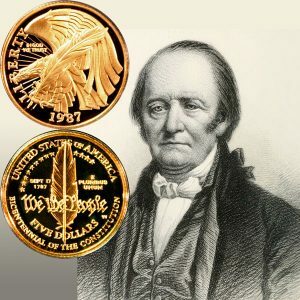 The Constitution Commemorative Gold Five-Dollar Coin shows with an image of Thomas Chittenden, President of the Convention and the first governor of the state of Vermont.